Dr. Adam Bauer graduated from the Rosalind Franklin University of Medicine and Science and did his internship at the Santa Barbara Cottage Hospital. He completed his residency program at the University of Arizona and later did his fellowship at the Cedars-Sinai Medical Center. Dr. Bauer is specialized in Radiology and board certified in Diagnostic Radiology, having Special Competence in Nuclear Radiology. 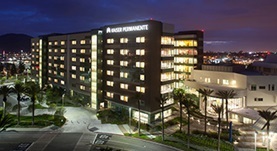 He has been in practice for more than 6 years and is affiliated with the Kaiser Permanente Fontana Medical Center. During his career, he has also contributed to two publications of medical interest. Dr. Adam Bauer has contributed to 2 publications. Dynamic 4D MRI for Characterization of Parathyroid Adenomas: Multiparametric Analysis. Nael K, Hur J, Bauer A, Khan R, Sepahdari A, Inampudi R, Guerrero M; AJNR Am J Neuroradiol. 2015 Nov.
Differentiation of solitary brain metastasis from glioblastoma multiforme: a predictive multiparametric approach using combined MR diffusion and perfusion. Bauer AH, Erly W, Moser FG, Maya M, Nael K; Neuroradiology. 2015 Jul.